The arguments were the same tired commentaries we’ve heard countless times now; “we need the oil, we don’t need to send our money overseas, national security, billions of dollars worth of economic value, etc, etc”. Yadda Yadda Yadda. What everybody failed to mention is reality; the area IS wild. I challenge anyone to visit the Refuge, traverse those majestic mountains, feel the vastness of the coastal plain, and argue that this is not wild land, is not wildness and wilderness. We can draw up our arbitrary lines of demarcation, our imaginary boundaries, but all this illustrates is how far removed we are from a real understanding of wildness, of wilderness. Last night I sat through 4 hours of public ‘comment’ that was largely a bunch of lies. Lies in the sense that the intent is to deny reality. The coastal plain of the Arctic National Wildlife Refuge is indeed wilderness. A great wilderness, a beautiful wild place. A wilderness, like all wild places, that is like no other. (c) A wilderness, in contrast with those areas where man and his own works dominate the landscape, is hereby recognized as an area where the earth and its community of life are untrammeled by man, where man himself is a visitor who does not remain. An area of wilderness is further defined to mean in this Act an area of undeveloped Federal land retaining its primeval character and influence, without permanent improvements or human habitation, which is protected and managed so as to preserve its natural conditions and which (1) generally appears to have been affected primarily by the forces of nature, with the imprint of man’s work substantially unnoticeable; (2) has outstanding opportunities for solitude or a primitive and unconfined type of recreation; (3) has at least five thousand acres of land or is of sufficient size as to make practicable its preservation and use in an unimpaired condition; and (4) may also contain ecological, geological, or other features of scientific, educational, scenic, or historical value. While I find the very idea of defining ‘wilderness‘ to be oxymoronic (the minute we define it, we lose it), I’ll leave that discussion for another article. The landscape of the Arctic National Wildlife Refuge is indeed a wilderness. The US Government might not yet understand that, but, it seems, that’s their own shortcoming; I realized it the first time I visited the place. Every single person I’ve travelled in the Refuge with, and every person I’ve met who’s ever been there realize it as well. To argue that this is not a wilderness is akin to arguing against gravity; it’s simply absurdly dishonest. The FWS would do well to deal with reality here; and recommend that Congress do the same, acknowledging fully the great wildness of the Refuge. Denial is, they say, one of the great signs of addiction; to live more honestly is to see things the way they actually are. And the wilderness of the Refuge, including the awesome coastal plan, is every bit as wild as we are. It seems that it might be beneficial to the cause in some way to become reacquainted with the work of John D. Rockefeller in preserving Jackson Hole & the Grand Tetons. He was instrumental in it. The point being that if the “most ruthless American” businessman, Republican, and founder of Standard Oil could see the benefit of preserving irreplaceable spaces then perhaps the rest of us could, or should, as well. His story in this regard is over at Wikipedia’s entry on the Grand Tetons or Jackson Hole. It’s an interesting read that very nearly parallels the issues faced by ANWR today. Having had the benefit of growing up in southwestern Louisiana adjacent to the Rockefeller Wildlife Refuge, I am acquainted with what can and has been done by oil companies/oil “people” when the occasion demanded it… and they did it in 1920… long, long before anything remotely approaching today’s collective environmental awareness was around to compel doing so. They did it simply because it was the right thing to do. If today’s crowd can’t clearly see the benefit of preserving certain spaces on their own merits then maybe they should be publicly shamed by the generosity of those who preceded them. Carl, you have another well-written post and solid defense of wilderness here. It is clear that you feel strongly about this land that you have experienced. The early conservationists such as my father, wilderness photographer Philip Hyde, experienced and helped others cultivate the strong feelings for land that come from experiencing it. 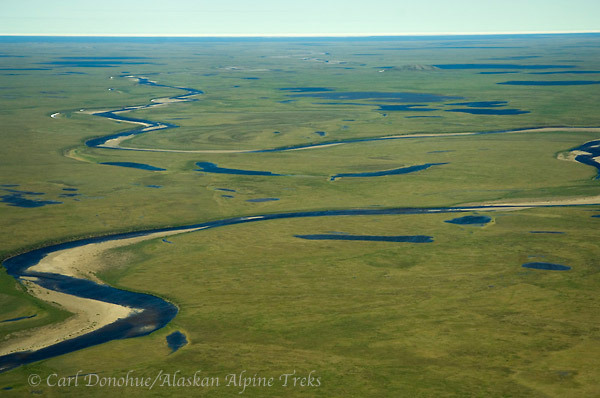 The conservationists spread the awareness of these places to others despite the risk that the wilderness might be “loved to death.” The ANWR is not in danger of this fate, but in danger of being drilled to death. Many people don’t realize what is really at stake. We stand to lose one of the last “untrammeled” wildernesses to oil drilling, for a tiny blips-worth of oil. All of the oil under ANWR would feed the United States’ gas guzzling habit for only a few weeks, but the wilderness would be deflowered forever. The only caution I would offer is to be careful about calling that section of the Wilderness Act clumsy or nerdish. My father worked with and was friends with the primary author, Howard Zahniser of the Wilderness Society. “Zonny” as his friends called him, was an articulate, brilliant, warm and charismatic leader. He had input and help writing the Wilderness Act from many of the top thinkers of the day. They worked on the language for more than 10 years. As you say, the very idea of putting together a legal definition of wilderness is absurd, but obviously necessary in this society. The Wilderness Act has protected hundreds of thousands of acres of land across the country and is the foundation upon which much of conservation and environmental law is based. That section in particular is worded very precisely and was edited hundreds of times before it became law through an act of Congress. Thanks for your comments here and support. Much appreciated. Perhaps an elaboration about the “wilderness” definition; the statement “where man himself is a visitor who does not remain” is simply incorrect. ‘Wilderness” is not dependent upon whether people inhabit the place at all. People have lived in some of the wildest places on earth for thousands of years. To frame this idea with the premise that wilderness is some kind of external thing is to mislead folks, IMO, and to start out pointed in the wrong direction. Gary Snyder writes of ‘the wilderness within’, instructing that humans themselves are wilderness, creatures of wildness. And we are. Wendell Berry has written at length of the dangers of this distinction between “man and Wild”. He suggests that such demarcation brings us too often to the place where we are now; designating this land over here as ‘wilderness’, to be revered for all time, and this land over here ‘non-wilderness’ to be stomped upon, “trammelled” in every way. And I think it’s a valid point. Hi Carl, both this post and your last show evidence of your strong feelings and serious thinking on these subjects. You are right about the Wilderness Act. It is not perfect. It is also the product of a different time. We are now more aware of indigenous people’s and their existence, probably because they have been far more “trammelled” than they were even in the 1960s. If the Wilderness Act were written today it might mention something about indigenous people versus colonizers and their development schemes. I recently interviewed the lady who added that particular word to the Wilderness Act, Poly Dyer from Washington, whose first Sierra Club board meeting was one where they were trying to lynch David Brower. She is now 90 years old and is still an active conservationist having worked with the Seattle Mountaineers, Puget Sound Keeper and other organizations that kept developers from shrinking Olympic National Park and finally are expanding Cascades National Park to its original proposed size 50 years ago. I am a big fan of Gary Snyder and his philosophy is correct in an absolute sense, but in practical application it has always been an all-out war just to get some areas designated where NO logging, mining, oil drilling, or other permanent activities of man are allowed. Sure, ideally we ought to treat all land with respect, but then we wouldn’t be able to have the “civilization” and “progress” that we do, would we? My statement there at the end reflects the traditional either/or thinking. Actually, I would suggest that we need to learn to have BOTH wilderness and all other land respected and cared for sustainably for LONG-TERM profit, as opposed to short-term plunder; AND Civilization with a new definition of “progress” and prosperity. I think you hit the key when you said “the product of a different time” – we all are, the struggle is to see beyond that, I suppose. That’s cool you met and interviewed Poly Dyer; that word is as fine as any, I think, for an understanding of wildness. She sounds like a tireless conservationist, something the world currently is in dire need of. I’m leery of “practical”; pragmatism too often becomes a crutch to lean on the way things are, rather than a leap into the unknown. In this particular sense, I think worrying about what is ‘practical’ steers us toward perpetuating and reinforcing the notion that we should not be a part of the wild; which is where the whole problems stems from in the first place. I agree we do need areas where no logging, mining, drilling and extractive activities take place; from a philosophical standpoint, we need those areas for our own sanity as much as any ecological reasons.